Were your ancestors Victorian pioneers?
. T. Bride. 1898. 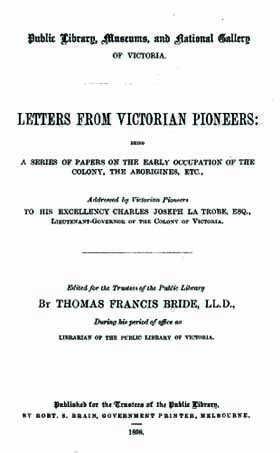 In 1853 Lieutenant-Governor La Trobe addressed a circular letter to a number of early settlers requesting information as to the time and circumstances of the first occupation of various parts of the colony. This book is a collection of those responses to that circular. The 58 letters record events which will recall to many persons still living old Victorian memories, and will have a great value for the future historian of Victoria, as narrating the experiences of actual movers in the early scenes of our colonization, while they will also possess interest as incidental contributions to the biographies of the men who half a century ago began to encounter the hardships and perils which beset the pioneer in every part of this continent. "These papers also contain interesting contributions to our knowledge of the aborigines, their languages, customs, and conflicts with the white men; and although some of the incidents narrated have found their way into print before, they are now for the first time given in their entirety to the public." Includes fold out map - "Rough Sketch of the PORT PHILLIP COUNTRY"
Letter from J. N. McLeod, Tahara - Lands at Indented Head in July 1837. Lakes Colac and Corangamite. Borhoneygnurk station, on the Moorabool. Mr. Russell compelled by attacks of natives to vacate the Leigh. Further settlement on the Leigh and Moorabool. Takes up a station on the South Australian boundary. Experience of the natives. Letter from Hugh Murray, Colac - First occupation of the Colac district. Instance of cannibalism. The Colac tribe. Letter from J. H. Patterson, Moorabee - Greenhill station. Bacchus Marsh district. Whyte Brothers occupy the Wannon. The Grange taken up by Messrs. Wedge. Tourbouric. The Campaspe and Murray. Moorabee.. The aborigines hostile. Letter from H. Norman Simson, Charlotte Plains - The Loddon, Glenelg, and Wimmera. Murder of Mr. Allan. The aborigines troublesome on the Glenelg. The Pyrenees. Letter from John Carfrae, Ledcourt - Various gleanings to Mr. P. D. Rose. Letter from David Fisher, Roslin, Geelong - The VDL Association. Arrival of Batman, Fawkner, Gellibrand and others. Early Melbourne. Fawkner's Royal Hotel. Batman's hut. Geelong. Two men killed by the natives. The Derwent Company. Exploring in the Western district. Letter from T. H. Pyke, Upper Werribee, Ballan - Werribee country. Letter from Edward Dryden, Macedon - Mount Macedon. Coliban, Campaspe and Loddon. Letter from John G. Robertson, Wando Vale - VDL in 1831. Portland Bay in 1840. Wando, Glenelg, and Wannon Rivers. Glenelg, Pigeon Ponds, and Chetwynd stations 1840. Dergholm and Roseneath stations. Fifty-one aborigines killed at the Fighting Hills. A harem of gins. Mr. Lewis speared. Wannon country. Letter from Charles Wale Sherard, Creswick Creek - Country on the road to Melbourne from the eastern head of Western Port Bay. Letter from Thomas Learmonth, Buninyong - First occupation of the Barwon, Moorabool, Buninyong, and Mount Emu districts. Conveying stock from VDL. Runs on the Barwon River and the Native Creek. Lake Corangamite. Occupation of the Buninyong, Ballarat, Maiden Hills, and Mount Emu district. The Buninyong aborigines. Letter from John Hepburn, Smeaton Hill - Stock brought overland from Sydney. Melbourne in 1836. Interview with Buckley. Foundation of the capital of Victoria. Gardiner's Creek first cattle station in Australia Felix. Opening up the navigation of the Murray. Originates the overland post. William Thomas - Brief Account of the Aborigines of Australia Felix. Daily life. Marriage. Laws. Dancest Games. Weapons. Statistics relating to births, deaths, education, crimes, & c, among the aborigines. Numbers of aborigines in various districts and tribes. William Thomas - Aboriginal traditions and superstitions difficult to grasp in their full significance. Australian deities. Creation of man. Creation of woman. How man first came into possession of fire. Notions of the flood. Tradition of the dispersion of mankind. Tradition of the origin of wind. Thunder and lightning. The Mindye. Charmers. Doctors. Arrangement of native encampment. Fight between the Barrabool and Buninyong blacks north of Melbourne. Ceremony of Murrum Turrukerook, or female coming of age. Ceremony of Tib-but, or male coming of age. Letter from Rev. James Clow, Melbourne - Dandenong. Earthquakes. Letter from J. M. Clow - Fine Plains. Letter from J. M. Clow - Occupies Balerook, Wimmera district. "Geordie," his wives, and children the sole aboriginal occupants of this isolated tract. Stratagem of the aborigines to murder "Geordie". Letter from Captain Foster Fyans - Musters 275 natives at Geelong. Convict soldiers. Portland Bay. The natives, Balyang, Woolmudgen, and Bon Jon. Number of the Portland Bay tribes. Comparison of the sites of Melbourne and Geelong. Letter from W. Odell Raymond, Stratford - Induced by Strzelecki's pamphlet to remove to Gippsland. Mitchell River. The state of Gippsland and a journey from Gippsland to Western Port. Letter from Thomas Manifold, Warrnambool - Port Phillip 1836. The first sheep at Point Henry. The Moorabool, Barwon and Leigh rivers. Discovery of Lake Purrumbete and the Mount Leura district, 1838. The Mount Noorat and Mount Shadwell district. The Hopkins River. Letter from George Armytage, Hermitage - Williamstown 1836. Murders. Search for Gellibrand and Hesse, and discovery of Lake Colac, Buninyong, and the Stony Rises. The Colac district. Letter from Henry Dwyer, Victoria Valley - Victoria Valley in 1841. Occupied by Thomas Woolley. Letter from Sir H. E. F. Young, addressed to Norman Campbell - The Lady Augusta and Mary Anne steamers on the Murray. Letter from A. M. Campbell, Ganawarra - Settlement on the Murray. Note taken from John Gardiner by Mr. La Trobe, on board the Argot - Port Phillip 1836 and return to VDL. Overland from Murrumbidgee with Hawdon and Hepburn. Letter from Philip D. Rose, Melbourne - Maiden Hills, Wonwondah, Fiery Creek, Emu Creek, Leigh, and Ledcourt stations. Murders by natives. Rosebrook taken up. Letter from George Faithfull, Wangaratta - Stimulus given to proprietors of Stock in NSW to migrate to Port Phillip by Sir Thos. Mitchell's discoveries. Ovens district. Natives troublesome. Letter from George D. Mercer, Weatherboard, near Geelong - First occupants of the Leigh and Barwon, and the Geelong district. Letter from William F. Splatt, Melbourne - Wimmera district. Occupation of the country on the Glenelg, Lower Loddon, Lower Avoca, and Lower Murray. The aboriginal inhabitants. Letter from Robert Jamieson, Melbourne - Melbourne in 1838. Cape Schanck run. Western Port, Yalloak. The Western Port and Gippsland blacks. Letter from Charles Wedge - Origin of the settlement of Victoria. First sheep landed at Williamstown. Stations of Messrs. Wedge and Mr. Simpson on the Werribee River. Natives peaceably disposed. Sir Thomas Mitchell finds Messrs. Henty's whaling establishment at Portland. Murder of Mr. Franks. The first overlanders. Arrival of vessels from England and Scotland. Country at the foot of the Grampians. The natives become troublesome. Letter from J. Blair, Portland - The Glenelg. The aborigines aggressive. Letter from William J. T. Clarke, Melbourne - Took up Station Peak and a portion of the Little River early in 1837. Removed to Dowling Forest and thence to the Pyrenees. Hostility of the aborigines. Billy Billy's station. Letters from Edward Bell, Wimmera - Arrived in Sydney in 1839. Started for Port Phillip, accompanied by Watson and Hunter. Formed a station on the Gilmore Creek. Ten thousand head of cattle on the banks of the Murray. Arrival at Melbourne. Settlementon the Broken and Devil's Rivers. The Wannon. The Western district. Mount Talbot country. Wimmera district. The Devil's River district. Englefield station. The Green Hills station. Letter from W. T. Mollison, Pyalong - A. F. Mollison's arrival at Port Phillip in 1836. Occupation of the Coliban and Loddon. Price of sheep and cattle. Depression of 1842-45. Memorandum by Leslie Foster - Occupation of the Avoca, Loddon, and Murray Rivers. Letter from George Edward Mackay, Tarrawingee - Occupation of the Ovens. Letter from William Taylor, Longerenong, Wimmera - Settlement of the district around Mount Zero 1843-1846. Letter from Charles J. Tyers, Alberton, Gippsland - Gippsland up to 1844. Letter from C. Hutton, Melbourne. The Campaspe and King Parrot Creek. The Goulburn and Campaspe blacks. Letter from John Aitken, Mount Aitken - Mr. Batman the first person who visited Port Phillip from VDL. Other early arrivals from VDL. Western Port and Macedon natives. Letter from Peter Snodgrass, St. Kilda - Settlement on the Goulburn. The natives. Letter from C. B. Hall, Amherst, Burnbank - Overland trip from Sydney in 1840. Avoca, Wimmera, Glenelg, Norton (or McKenzie), Loddon, &c. The Mindai. Exploration to the north of the Pyrenees. The aborigines hostile; numerous about the Grampians. Superiority of the Loddon and Marrable natives. Letter from Colin Campbell - Port Phillip in 1839. Mt Cole district. Aborigines. Letter from Edward Grimes - Names of early settlers on the Broken River and Lower Murray. Letter from John Templeton, Kyneton. The River Goulburn, the Broken River, and the Devil's River. The Western Port district. The aborigines. Letter from Alfred Taddy Thomson, Fiery Creek. Ascended the Broken River in 1840. Discovery of the Mount Battery district by Watson and Hunter. Aborigines troublesome. Murders. Waugh leaves the Broken River a ruined man. The Fiery Creek District. Letter from Thomas Chirnside, Point Cook - Arrives at Adelaide in 1839, reaching Sydney two months later. State of NSW. Takes cattle overland to Adelaide. The Loddon. Station at Mount William. Station in the Adelaide territory. Port Phillip the Eden of the colonies. Characteristics of the settlers in the different colonies. Letter from E. P. S. Sturt, Lonsdale-street - Commissioner of Crown Lands for the Murray district in 1837. The Billabong country and the plains between the Edward and Murrumbidgee Rivers. Destruction of Faithfull's party. Natives always treacherous and devoid of pity. Trip overland from Bathurst to Adelaide. Mt Gambier. Letter from Dr. A. Thomson - Melbourne 1836. Built a church. Arrival of Mr. Batman. First census. First herd of cattle brought from Sydney. Geelong and the Western district. Lonsdale's notes on Dr. Thomson's statement. Letter from A. McMillan, Bushy Park - trip from the Maneroo district, in 1839, to the south-west towards the sea-coast. Discoverer of Gippsland. Station on the Avon in 1840. Port Albert. Letter from S. G. Henty, Portland - Portland Bay in 1833. Arrival of Francis and S. G. Henty. Major Mitchell's arrival. Hentys occupy Merino Downs and other stations. Arrival of Samuel Winter and others. Journey to Cape Jaffa. Port Fairy. Application for land at Port Phillip. Letter from C. J. La Trobe, Melbourne, 22nd January 1853. Death of Capt. Dana. Letter from Hugh Jamieson to Bishop Perry, Mildura Station, River Murray 1853 - The aborigines capable of only a limited improvement. Have no knowledge of a Supreme Being. Death attributed in all cases to human agency. Numbers in the Murray and Darling tribes. Infanticide prevalent. Their diseases and physical sufferings. Cannibalism. Marriages. Probable future of the aborigines. Notes on Port Phillip, by Thomas Winter, of Hobart, in a letter to Mr. Swanston, c.1837 - Port Phillip visited in 1802 in order to form a settlement. Batman and others induced to visit Port Phillip. The natives. Gellibrand's memorandum of a trip to Port Phillip in 1836 - Embarks on board the Norval. Lands at Western Port. Mr. Mudie established at the Government settlement which had been abandoned in 1827. Journey overland to Port Phillip. Conversation with Buckley. Examination of the districts around Melbourne and Geelong. Letter from John Hart, Melbourne - Visits Portland, Guichen, and Nepean Bays in 1831, on a sealing voyage. Life of the sealers on Kangaroo, Thistle, and other islands. Second sealing voyage between Bass's Straits and Doubtful Island Bay. Enters Western Port in December 1834. Ships bark to London. Returns to Launceston, and gives account of his trip to Conolly, Fawkner, Evans, and Batman. Drives a herd of cattle from Portland to Adelaide in 1837. Specimens of the language of the Barrabool tribe and list of members of the tribe, collected about 1842 by Mrs. Davenport. This is an invaluable genealogy resource for anyone exploring their Victorian family history or building a family tree.